From Stephen Downes -- Reuters closes its second life desk - not sure people knew it was there or how to use it to begin with. A website of study groups and sharing information. Would be interesting for testing to see the features that work here. Interesting post about 100 great video lectures. Looks likely that president elect Obama will support elimination of Daylight savings time in the US. This op-ed piece in the New York times talks about how DST does not link to energy conservation as once thought. The one thing it WOULD make easier is global collaboration - Google Cal doesn't convert to dST until AFTER it happens and we all missed a meeting. This hack just in from Flat Classroom. We've been using it a couple of weeks and it works very nicely. Last year we stumbled on it and I didn't realize how useful it was. When you want to easily take a file off a DVD. 1) When you put the DVD in the computer tell it to NOT play the dvd. Instead (on a PC) right click and open the DVD. 2) Open the file folder on the DVD and look for the .VOB files - usually there are 2 or 3. 3) Make a directory on your hard drive. Then, right click and copy the VOB file and paste it into the directory. 4) Right click on the vob file and rename it *.mpg - where the * is whatever you want to call it. Although the quality seems to degrade a smidge - it is a file ready to edit and put up on youtube or wherever like flat classroom. This way, we rip from our camera directly to dvd and then can edit w/out coverters. Also, some of our football heroes have been able to snag game film to edit and include. I'm sure there is a better way and something that I may do that is not quite OK - the only caution is that I think this can be used to snag film that is copyrighted, so use w/ caution. Let me know if it works for you too. I found this tip in a remote forum in cyberspace somewhere and had never heard it but use it all the time w/ film editing now. The page documenting the students who used Google lively to teach middle schoolers about digital citizenship. This year, some of my students have used woogi world to teach fourth graders about digital citizenship. This wiki documenting their efforts is to be finished by next Tuesday. This is a great project. Emotional INtelligence Questionnaire online. Note that you'll answer about 125 questions but that to get the report, it costs $14.95 at the end - don't waste you're time if you're not going to pay for it - IT IS NOT A FREE TEST but you can see the questions they ask. Emotional Quotient - Inventory test linked to from the College admissions article. There are some GREAT books on Emotional intelligence, but Debra Sanborn, Program Director at Iowa State University, is using an emotional intelligence assessment as part of the "toolbox of assessments that she relies upon for identifying issues challening students in the first weeks of college." She says that EQ has an 85% predictor rate of success in college. The EQ-i assesses 5 aras: interpersonal, intrapersonal, stress management, adaptability and general mood." Who is using this in high school? I read a book on this to help my two kids with learning disabilities but if there is a test or profile that would help us with these kids - to develop emotional intelligence, then we should do it. Life success is SO MUCH MORE than test scores! Hate that we have to have a "test" to measure this one - although the result is more an indicator of a person's behavior, albeit self-reported. 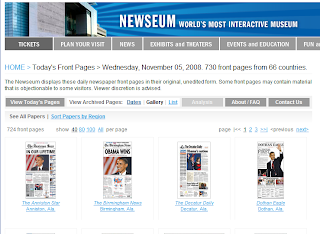 Edublogs has begun embedded context sensitive ads into the blog posts of its authors. I agree with Christopher Sessums, the ethics of this is very questionable, particularly if people aren't asked or given a chance to turn it off. Google Orkut users stealing photos. Interesting comments here on this photo about Google Orkut and people stealing Flickr Pictures of children - this is from 2007 but the conversation is interesting -- we want to SHARE photos but not SHARE them in inappropriate ways -- how can we license for NON ADULT use -- and doesn't "adult" have two meanings here? 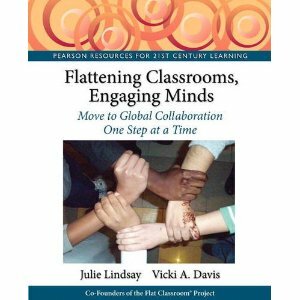 Estie's Gifts & Treasures: Attending the Flat Classroom Conference...Will You Help? Estie Cuellar from Texas has a dream to take nine of her students to the conference. While many of us have raised our money from private donors, Estie is located at a school with many underserved children from families in poverty. I have pledged to do what I can to help her spread the word about her situation. She has scholarships for four of her students to pay their conference fees, however, all schools must raise money for their own airfare. This is a great cause and I hope that there are some people out there who believe in the vision of representing ALL of our society here in America at a conference which plans to turn conferences upside down -- working hard to give students a meaningful place alongside the educators who will be attending the leadership strand of the conference. where he points to my Google lively post about my students losing these great virtual worlds that they've created. Then I reminded myself that Google is probably the largest advertising agency in the world, a public corporation with over 20,000 employees worldwide who need to get paid and shareholders who aren’t in it for the good of you or me. What would happen to my files if Google decides Docs does not provide a sustainable revenue stream? What if Google appoints a new CEO who thinks differently? Are these things really so far-fetched in the current economic climate? Finally I couldn’t help but wonder if we would not be better off promoting the use of Free and Open Source Software to create and share universally compatible and locally hosted content instead of the likes of Google Docs (visit the Open Source Schools website for more information on OSS). I think there is an important point to be made here -- what is the alternative? Most school IT directors delete EVERYTHING in the summer time -- not archiving of student work. Additionally, if a student changes schools and doesn't think to backup their files - they don't have them any more any way. Honestly, I think that Google Docs has a longer "shelf life" than the typical folder on a server at a school. I think of how many jump drives my students lose and how many of them come back years later to ask for that copy of the resume they left on the server four years a go -- there is no way for me to find it. I just don't think that IT departments have the kind of archiving to compare to Google Docs. Sure, if the student is very responsible and can remember to store their files and keep the jump drive - fine. But I know for me, I often do not. Besides that is the rule that if something is created or stored on a school or college's network that it is the intellectual property of that school or college - some may actually prefer to store those files at an offsite location rather than on the school network. I don't think this is as clear cut as it seems. 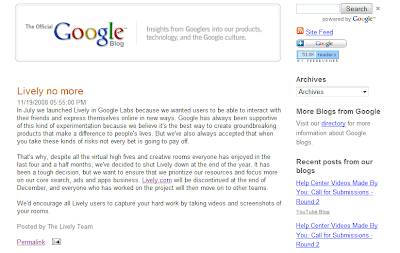 I think that what happened with Google Lively should serve to add a caveat to our work, rather than a defining moment. Oh my goodness - this is terrible. A florida teen committeed suicide via webcam. This is horrible. Knowing how to report online crime is something we need to be able to do - a sort of e911 for online is what we need. Educators better learn the lesson of detroit -- if you treat enough people in the wrong way - they won't be there to support you. Kids won't be kids forever and one way to kill your school in the long run is to be unkind and unlistening now or just to not educate them or tell them what they need to know. Website with over 50 typing games. A video website to sell and market online web content. Wonder if it is a bit like the teacher lesson plans site that some tried. We need judges for this year's project!!!! Please learn more and join in and help!! You'll learn how a project like this works and many judges go on to make their own project -- you'll have 4-5 videos to produce depending on the number of judges that sign up. 30,000 Wellness Activation Kits are available online for schools in the US. Check out htis program and look at it for your PE and health programs. Alice Barr's thoughts about the Maine Student tech conference. THESE ARE GREAT!!! We need one in every state! If you want more "bling" for your blog -- Diigo has a new program to recognize educational pioneers using Diigo. Since the beginning, Maggie Tsai has listened to educators (not just me) in amazing ways and this is great. If you have a classroom diigo group, then log into your teacher console and snag your "diigo educational pioneer" badge - I'm going to get mine!! We use diigo groups for all of my classes and we have tag dictionaries based upon the major topics we cover. 40 literacy blogs aggregated on one pageflake. This is a great example of the building of customized PLN's to help others understand the purpose of a PLN. If you're a librarian or working with literacy -- why not set this to be your start page - even for just a few days to see what happens. Or, even better - use your favorite rss reader and construct your own Personal learning network using many of these blogs. Just some reasons why my students make me so proud! I've been out this week, here is a sampling of some of the emails in my inbox as I'm checking it in the Atlanta airport. You can see, that I'm a coach and my students and I have a relationship. They are professionals and they amaze me. This is what happens when student projects become OWNED. "I was out of your class Tuesday and Wednesday because I had to go to the doctor, and I was sick. I have recently been informed that there has been some plagiarism on the wiki. We have been researching most of the wikis and found plagiarism on some of them. I have decided to post a blog post on Digiteen to inform everyone that plagiarism is illegal. If you have any ideas on how to deal with the plagiarism, please email me back." This is about http://wiki.digiteen.net and plaigarism is something that does happen - we have to continually work on this as teachers, but many of the students get very angry and want to work with it!!! "Hey Mrs. Vicki this is ********[name removed]. The class has received your email about Lively and we are discussing the different options that we can do to convince Google to keep Lively open. We have came to a decision and we would like to make a Jing and a video. We are asking the Pierson company if they would be kind enough to send us a copy of the film that they produced last week. We would be interested if you would give us your different opinions." The Pearson organization filmed them last week and it won't be ready until next year, but look at how they are thinking!!!! I had others about converting file sizes and more on plagiarism, but this is what strikes me. These students are internalizing this. They are learning and they are becoming activists. They are active in their world, not passive. They are growing in their leadership. Oh, and these are ninth graders! I'm the luckiest woman alive because I feel that I have a great family, kids, and amazing students in an empowering school that lets me teach and doesn't expect me to be a babysitter or a mindless teacher of the bubble-in grid overkill that someone has decided to call a measure of good education. Veterans Hisotyr Project -- get a field kit and film your local veterans - submit this to the library of congress - I saw a presentation on this in Illinois and it is amazing what they are doing with this. They report how much the kids now love history and it is amazing. WE NEED TO BE DOING THIS. 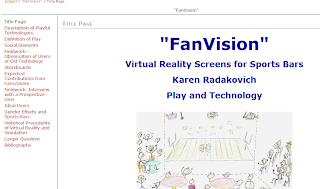 Insert live web pages into your powerpoint. I'm amazed at this presentation and am sitting in the last half. Everyone has the same interview questions - they developed some, they add some of their own. The library of congress field kit has some questions. They want a full class of kids to do the project. They are integrating in history and journalism. They don't want the same kids doing the same interviews over and over again. Discussing how do you measure impact? They have a rubric that they are going to evaluate against - looking for quality. Many people have oral stories on cassette players -- if we could get pictures and good audio - then make them postumously. I would love to do that for my grandad. I think I have him on cassettee players. In this project, they've only spent about half their money. The project is growing and trying to support the kids they already have. They are trying to figure out how to keep things quality and expand in a meaningful way. They are selling memorial bricks to get the money back in the project. The first time they did it, everyone came into one place, they are looking to start doing those regionally -- drive in and then go home. This is the next thing happening on a Saturday, it seems that we're too busy during the week to do what we should be done (PBL) and instead have to do it in off hours. Concentrating on WW2 b/c they are losing them now -- in 5 years so many of them will be gone -- the youngest are 81 and the oldest are in their 90's -- some of them, their memory is going. It is so important to do this NOW -- sometimes they get confused. I'm sitting in a session about the Students involved with Technology Conference in Illinois. These are my live notes. I'm so impressed, this is a conference by students and for students. 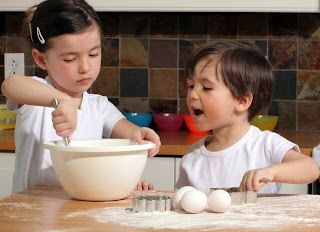 Every student has to choose what they want to be: a participant or a presenter-participant. If they do a presentation, they have to have a sponsor. They give demos and presentation on hardware topics, robotics, gaming, web design, video editing and many other topics. So, the students sign up - they charge $18. They charge to cover minimal costs, but if you don't charge, they don't show up. They have GREAT prizes: laptops, wii's laptops, HDTV's. They go up to 500 students -- it is all about the keynote speaker, they say. If you have a great keynote, it helps. Students grades 3-12 from Dewitt, Livingston, McLean and other counties in Central Illinois (and beyond.) Last year, they sent the video out by keynote. My notes -- I'm amazed at this concept. Anyone want to help me start one in south Georgia? Presenters come in the night before - look at the room, get a big picture. They don't really want parents to come, only their adult sponsor. The reality is that sometimes parents just walk in, but they really want the students by students. They have over 70 sponsors for the conference! Drop kids off - volunteers signing kids in - get booklets. They get their booklets, their bag. They mull around for just a moment -- go to the keynote speech -- they did it w/ video this year. They select what sessions that want to go to. A couple of years a go, Dance Dance Revolution was big. The popular ones they offer multiple times. They insist that you are in a session - no clusters in the hall. These children choose to be there - this is on a Saturday. Sometimes you get kids w/ higher expectations than you want to deal with - but it is a really small group of kids. The energy of the conference day is just amazing. A many is sharing about how he was a teacher in technology in high school - they had high school students presenting from 3rd - 12th grade about the student run video program. The sponsors have to hold back and let the students develop their own 20 minute presentation. Note to self: Perhaps for Flat Classroom - we have 10 minute student -led tech talks -- maybe we should have them "pitch" their presentation on the ning and then let the voting happen beforehand. Hmmmm. How will we select the Ted Talks student presenters. They ask the teachers who have students who "get" the technology to present. Sometimes it is an individual OR a team. His daughter presented when she was a 2nd grader - she did Webkinz w/ 2 other girls from another district from her swim team. Not about one school or another - it is about what we're doing. Produce and present -- teaching others is the highest form of learning - they are trying to focus on that diligently each year. They get a new aspect of teaching once they have to stand in front and do it! Deb Wylie, Illinois State University and Kim Traverse, Heartland Community College presenting. They fill out forms, vegitarian, diet issues, etc. During lunch - all tables colored w/ paper and crayons - they start drawing on it for the logo contest. They tried doing it on computers one time, but they are doing it this way now. State Farm is their major sponsor for this. Have had sessions in the past where students can come in and build projects. They had a hovercraft project where students got to build one and take it back to their school to use at their school -- built hovercrafts you can float down the hall. They want to figure out a way that they can do more with it. So, now they make mini hovercrafts w/ paper plates using mini cpu fans!! Batteries and Mini CPU's. Note to self: I want to build a hovercraft!!!!! ;-) I WANT ONE!!! Need to find out how! I LOVE THIS IDEA!!! This is great. They have a "monetary system" - SIT Bucks - give them out for (this year they'll have a tech hero) - -bucks that they give out to the presenters -- they had out questions when people ask questions -- reward great behavior. Need to get sitbucks. They put their name in the pot for the prize they want. They write their name on the back of the sitbuck and there are buckets for each prize and the kids put their name in the bucket w/ their SIT bucks and they go a drawing. Note to self: THIS BELONGS AT CONFERENCES!!! THAT IS GREAT!!!!!!!! They give sitbucks for helping. They give sitbucks for everything. They do a feast in the summer for the teachers - it focuses your program on good behaviors. You MUST be present to win -- put at the closing ceremony. Wrap them in gift boxes -- a sign says - in this gift box there is this -- this is the Lego one, the Nintendo DS gift box -- put descriptions of prizes in the booklets - 1, 2, 3, 4, 5... etc. It also helps w/ security too!! Only had one ipod missing one time -- so doing the baskets works well. Last year, the large flat screen TV and entertainment center. Talking about the kid who won it - had his dad come in the truck. The Dad was so excited about it. For the prizes -- State Farm gives them a check and they also get money from proceeds for the trip. Never turned down a student who wanted to come. Many schools pay the registration. If they present, they don't have to pay for it from some schools. They keep registration low b/c it can be challenging to pay for it. This is a great thing!!! How exciting!!! I wonder if my students could put this together!?? This is cool. The presenters pay to go, but the districts decide -- some districts pay the fee for their presenters, some do not. Some pay for everyone to go as part of their curriculum for those who want to go. Also promote and have videos to help the kids out -- things to think about when presenting. Made videos ahead of time - things to prepare for the conference. What you want to know how to do. Getting ready for the conference. This is another great idea! Wow! Sponsors play a great role also. If parents want to come, they ask them to be volunteers -- help hand out lunch, etc. and then they can see their child. It is a great experience in that way. In the fall of the year, ask the kids, "who wants to be a presenter," then help them formulate what they want to present. What do they want to bring? If they want to bring everything -- coach and say "well, you may not want to take all of that equipment - doesn't make sense." Sponsor, helps set up room, but helps, the student is in charge. If something goes wrong in the room, the sponsor handles the liaison with the technical person b/c sometimes things go wrong. The student is reassurred. 20 minutes is a long time for kids - seems like a long time for kids. Sponsor multiple presentations -- many people do - but groups of younger kids need a little bit more help. Tried to make the educator who sponsors a team stay in the same room. Watching the parents come pick up their students -- it is very exciting to see how excited the kids are. It is so fun!!! Everyone is so excited! You have to have an emcee for this whole thing. They did a video about the sitbucks and how that worked. They have kids make videos and let them see others present. I really think this is the way we need to go. This is a GREAT project. I wish we could hold during the week, but some might say it is "too fun." But, by having it on a Saturday, you do have some self selection in that way. This is great!! WOW! I love the handouts. The presenter says out of all of the conferences he does, that this one is the easiest one he does! They really don't have many problems. Their problems is that rooms fill up or they cry if they don't win a prize but that is it! In my opinion, Google shutting down Lively on the heels of a major price increase over at Second Life, is a major mistake. My students LOVE lively with Digiteen and I was just about to come out with a major recommendation on HOW to use this great tool for educators. On their wiki, students are beginning to describe and share their work. What are our alternatives? We need ways to download these rooms! My students have done amazing work!! This is really horrible -- I'm waiting for the "backlash" from my students as I just sent the email out this morning. Just wait, we're going to talk about how to act in ways that Google MIGHT listen -- I'll keep you tuned. I think when my students read their email this morning, I'll hear them shout all the way to Illinois! From David Warlick - Google life photo archive. This software lets you take one host PC server and this lets you virtualize servers. In Walton County - have 100 servers and 60 are virtual. All independent and have their own IP address and appear completely independent -- they have 6 blade servers. This does cost money. This would let me move the Accelerated Reader and Accounting system to separate "virtual servers" and if one needed to reboot, I could reboot a "virtual server" and not the physical server. This is from an expert IT - Jack Higgins, Network Analyst - Walton County schools in Atlanta, GA -- met by accident in the Atlanta airport. A lot of these bookmarks are from him! This lets the processes run by windows be shared by all the "virtual" servers so it requires a lot less power and is very "green." Anything taking up memory space that is duplicated, and it takes up one. Rushton Hurley works with this cool repository of free online videos for teachers at nextvista. Google map showing all live piracy incidents in the world - this would fascinating to discuss this in a current events class and correlate the incidents of piracy with political regimes and other correlated items. Present to the class- here is the map -- figure out why this may be happening in these places. Create an inspiring invention Public Service Announcement (they do want you to download the Sony creative software.) - from Sony and Discovery Education. This is the reflective blog post due at the end of digiteen this year. Not surprisingly, the study found that children are communicating with friends, peers, and others online in ways that show a lack of knowledge in what is ethical, safe behavior. Only 50% of these young children said that their parents watched them as they used a computer, revealing that the other half were exposed to unchecked Web browsing and interaction with others online. About 48% of these young children saw online content that made them feel uncomfortable, and one in four of them said they did not report the uncomfortable experience to a trusted adult. Only 32% of second and third graders reported being watched by their parents while online, and 31% of fourth through sixth graders said they were watched "a little" or "sometimes." Almost one-third (27%) of fourth through sixth graders said they were completely unsupervised when online. Among second and third graders, 9% admitted to being "mean to someone online" and 18% reported that someone online had been mean to them within the last school year. Among fourth through sixth graders, 7% reported being a victim to bullying and threats online, and 10% reported being embarrassed. 13% said they had been bullied or threatened online, and 15% had been embarrassed. Among tenth through twelfth grader, 15% reported having been harassed or stalked online, and 17% had been embarrassed. it is more common for children to run into problems with people they know online than with strangers. These troublemakers are more likely to be other students rather than adults. a more prevalent problem that children face online is cyberbullying. This comes back to Digital Citizenship education, like we're doing here with Digiteen. An example of how the Internet often "makes" news. Although many people believe online sources above traditional media, verifying sources is still something that should happen. Again... don't believe everything you read, ANYWHERE! So, if you haven't heard the latest twitter "scuttlebut" which finally knocked SNL off as the #1 search term on twitter, it is the Motrin Mom's ad. I think there are more important "fish to fry" than this one and like some others, wish that we focused on some more important things out there - like accommodating those with LD as we should - however, I do agree that Motrin was so far from clueless. The #1 rule of target marketing: Respect Those You Target and Motrin seems to have missed this. As a mother of three, I'm proud of every stretch mark, ache, and pain because I love my children and I carried them in a sling sometimes and sometimes I didn't. Motrin was trying to be funny but really missed the mark, I think. Barack Obama to deliver weekly presidential address via Youtube. Once Upon A Teacher: Wireless Please! Hearing this type of story with first grade teachers for an all day training with ONE internet port and no wireless so upsetting. They don't have the "bandwidth" for wireless. Something is wrong there! This is exactly why those people who use RSS readers to scan through thousands of feeds, read blog posts from various decentrally connected sources and who engage themselves into assembling multiple unrelated sources of information into one (probing connections between them) have much greater ability to sense and respond to changing conditions in increasingly complex environments than those who read only the major newspapers, watch only the major news networks and don’t put themselves into a difficult situation of being hammered with a lot of stuff at once. Linear, intentional learning was how you learned in the past. Enter nonlinear, visually active way of learning of the future. This is where we must move and yet, it starts with teachers building their own Personal Learning Network from a variety of sources. Are your students building a PLN for each project or major course of study? Slide taken from Flattening Classrooms, Expanding Minds. Basically twitter is a search engine for people. "So my question to you, my readers as well as to myself over the next few days is - how can I measure what my students think is important and relevant? I am considering some kind of electronic survey (so I can get a diverse sample) and I am wondering if I can somehow “narrow in” on particular topics (the way your eye doctor asks you lens1 or lens2?). Keeping in mind that I want to highlight particular aspects of computer science (see last post) I need to really think about what kinds of questions I would ask in order to get really interesting results." 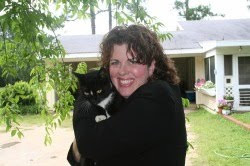 Leigh Ann is reflecting on another great article from Joanna Goode from the November 2008 issue of Communications of the ACM: "Reprogramming College Preparatory Computer Science." I just urge her to realize that sometimes students don't know what they don't know. I find that the reflective part AFTER a course is taught where students tell me what was best, most meaningful, both in a survey and open blog reflection often tells me the most! 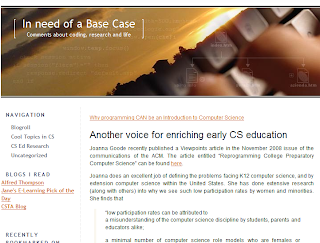 I also hope that Computer Science teachers, in their quest to teach programming, don't lose sight of the fundamental need for collaborative environments, the ability to write in hypertext, effective online citizenship, and other issues that are also NOT being taught in schools aren't left by the wayside because it is not "programming-y" enough and indeed in the way we've defined Computer Science, that is being done. Names are popping up for education secretary amidst much discussion. Here is a recent one that I've seen named several times -- Joel Klein, chancellor of NYC public school system. It is called "mathetude" - however, this digg-like aggregator for technology and education is fascinating with readers giving "apples" to the news stories. I've enjoyed browsing through what they have in this repository of current news. TPS reports have a whole new meaning in Tulsa Public Schools where the report overviewing conditions at their alternative school are being withheld. This is a "dicey" area at best and one that no administrator wants to be in. I have friends who work at alternative schools and tell me that they are basically ignored and not treated as "legitimate" educators. NO teacher is a babysitter. NO teacher is a "jailkeeper." Teachers need to teach and if conditions are bad, people should know about it. Just a thought for the administrators out there, if you have an alternative school in your charge -- have you gone over lately to sit in on a class. And if you're not going to sit in on a class or are afraid to, then how do the teachers feel? Get out there and improve education for everyone. For, in this sort of situation as with TPS, everyone loses. “real” isn’t necessarily the goal of simulation. in play, as I discuss in my section on ideal users. Wow! This insight is phenomenal. I can feel my brain shift on the idea of virtual worlds and simulations! This is from what is obviously an efolio from a student and although it has her name on it -- how can I reach her? How can I talk about this? How can I discuss this amazing work? What class was this done for? What did the professor think? More More... I want more. Just can't help but feel that this incredible project, which is available online for us to see, was somehow sliced away from the owner as I have no URL to link back to the student who now may be doing something else entirely. I can't even find a date on the project! Each work should be dated. Can the work be linked back to the course, professor, and educational entity? Can the work be linked to other similar works -- perhaps students should link to several related projects from prior students. Divorcing student projects from the author bothers me a bit, but this whole idea of a true lifelong digital portfolio has its pros and cons. Hey, you can put text in animoto videos now!!!! How exciting!!! This is great! I love how it adds to the digital story - we have had to put it on the videos. This is great!!! So exciting! PHENOMENAL discussion of Internet use in Brazil, including a great discussion about how students are taught and use the Internet in Brazil. So many things are discussed. Orkut is the most widely used website in Brazil -- and holds the record as having the highest percentage of use of any website in any country. Orkut is Google's social network and is also very popular in India, Pakistan, and Brazil. Fascinating listens from the BBC - their essential guide to the 21st century. A fascinating term that I cannot recall hearing is the "digital underclass" -- People who have "no chance of every going online." They are predicting that these people will be responsible for the next shift in the balance of power in the new century. Wow!!! Using cell phone technology, high powered medical diagnosis and lab work can be provided remotely through cameras. This is what letting students work with cell phones can do as this is Daniel Fletcher and his undergraduates at the University of California worked to create a mobile diagnosis tool from cell phones. THIS is innovation. Harness the untapped power of student creativity and innovation and use it as a learning process. DO IT NOW!! Here's your handheld projector - as my students and I joke - kids will no longer be texting in the bathroom but watching movies. Movie Maker 2 is a great entry level moving making program for the PC -- and MovieMaker comes FREE with your PC. (I highly recommending updating Movie Maker before embarking on a project!) I love atomic Learning, and this should be a great tutorial. 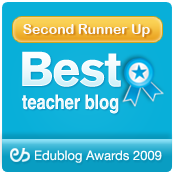 2008 Edublog awards are open - nominate your favorites. I've had the honor of being nominated for these awards since I started blogging, but have never won a coveted "Eddie." This is one of the few awards I do think means something, although no one should blog motivated by receiving one. We blog because we believe in the nobility of what we do (teach tomorrow's future) and in sharing with others around the world of a like mind. How to make a self grading quiz using Google forms. This is great for those who don't have access to online tools that will let you do this. As a benefit of being a Google Certified Teacher (GCT) - I have access to these forums that have great tutorials and information that other GCT's have shared. This is from GCT, Jesse Spevak. This is a great screen tutorial from Jesse Spevack a fellow Google Certified Teacher (GCT). I must say that the private GCT community is one of the most active, thriving communities in which I participate. It is an incredible network of teachers and part of what we do is share things (both Google and non google) with one another! "When you integrate all of the senses, then the students start to ask questions," McDonald explains. "We say, 'Smell this, taste this, look at this.' And then they ask, 'Why?' And then we respond, 'Let's look in this book and see if we can find the answer.' Kids need a tactile relationship with the environment, and we provide that tactile info, which then can open the mind." This from Janet McDonald, manager of Rochester Roots, as quoted in Edutopia's recent article Cultivating Minds: Food-Related Curricula Take Root Nationwide, by Bernice Yueng. Using food in the classroom has long been a strategy of renegade teachers, although perhaps not in as meaningful a context as this. Mama and the "Bad Boys"
My Mom first started teaching at Westwood when there was a group of "bad boys" that no one could teach. She taught this group Math and English and surpassed much of what the other teachers were doing in their classroom. How did she do this? Every morning, she baked. From homemade cinnamon rolls, to cake, to any other thing you could imagine, she did it. She'd come in the morning and put the delectable food at the front of the classroom, as sort of a centerpiece and then she would lay forth the objectives of today. It only took one day of whisking the uneaten treat at the end of the class and these boys were hooked. They only got the treat if they earned it. Now, there are those who will look down their learned noses at such a base motivation system. However, everything else had FAILED. And this worked!! These boys learned a lot, and my Mom stayed on at the school after they graduated to found our technology lab in 1991 in the room in which I now teach. She is my original educational rebel. She would teach "by any means necessary" and do what it took to teach. 5 minutes - Warm up. This is bell work, they start doing it immediately. 15 minutes - Oral drills, lessons, and timed writings - This lets the students HEAR what they are typing, or lets them practice to get faster, depending upon the lesson. 5 minutes - Lesson wrap up, printing, cleaning up the room. Although this is one thing -- keyboarding -- each day we eat, listen to music, hear lessons, read the book, and of course, touch the keys. If we didn't eat candy or listen to music, I don't think these middle schoolers would be able to make it through the often boring, keyboarding practice. The key to keyboarding is repetition. The key to maintaining repetition is variety. I'm a farm girl and love the outdoors and think that using the outdoors and all senses makes a LOT of sense! From Sara Ackerman Aoyama wrote a marvelous paper about The Role of the Sense of Smell in Language Learning in which she explores the use of the olfactory sense in the classroom, an area of research which seems to be in its infancy. I've heard people discussing this at conferences who told me that some studies have shown that if you take a test in a similar environment that you learn in, you will do better at recalling that subject. i.e. if Math smells like cinnamon and then you take the test smelling cinnamon, you'll have better recall. Of course, we're talking recall here -- and this makes sense. I just don't know how much it would MEAN and could envision schools having whole "smell strategy" workshops and pumping fragrance into their gyms so that they'll "smell math" when they take the math section. That gross misinterpretation of this point aside, I DO think that the integration of all of our sense in learning including outdoor learning experiences akin to those in the Edutopia article and geocaching have a lot of potential. In many ways I wonder if we're sensory deprived and the good teacher is allowed to integrate all of the senses. I advocate flexibility with this, and not prescription from higher ups, though. Let the teacherpreneur use these tools to customize the classroom. I recall a "rebel teacher" friend of mine who slyly told me that she lets her kids chomp on gum while taking tests to keep them focused. She swears by it and it makes sense as well. So, how do we integrate the senses into the classroom? Tell your story and share how you use the senses to teach. It would be great to share these stories, either on your own blog, or in the comments below. Let's learn more about this. And teacher: remember, you have the most noble calling on earth. Have the strength to advocate and do what it takes to make sure your students learn. Photograph is licensed from istock photo, you do not have permission to copy or reproduce this photo. Fair Use Best Practices are being redefined today, November 11th. The Democrats absolutely must not engage in a single bit of unilateral action; they must work very hard to include the tattered remnants of the Republican party in all discussions. This is a political reparation, I think. How fitting it is to be led by a man of color." Here, one week after the election, I think that this post has some great things to say about inclusion of both sides. After the election is done, the president now represents ALL of the people, not just those who elected him (or one day, her), and those who retain their popularity are those who remember this! But yet, some have asked me privately why I didn't come out and endorse either candidate. Well, I heard pastor Joel Osteen in a recent interview be asked the same question. He said something like "It is my job to minister and I work with people on both sides. I will not allow my political stance to reduce my mission in life to minister to others." So, he voted his conscience and kept his focus, and that for me, I felt was what I should do at this time. I don't mind speaking out on unpopular or popular issues, but this was what I felt I should do at this point. I feel called to speak out for those with learning disabilities who are being harmed and not helped by our current way of educating children. For teachers and to teachers. There is a mission and calling for me with blogging and anything that would diminish that calling is not what I want to do. In these tough times, my husband and I've had the discussion of Google Adsensing this blog on several occasions, but it comes back to the mission and purpose with which I'm called and being part of a legacy of change spawned by the tens of thousands of educators who are also connecting, sharing, reflecting and acting to move ahead towards change. We can be professional and disagree without being uncivil. We can be respectful of another person and not impune their motives, while tackling heavy issues. We can be wary of "taking sides" and remember that even a fool, whoever he/she may be, is right some of the time. We can also know that none of us has a monopoly on wisdom or ideas and that arrogance is the great enemy of us all. Can't Educators BE the Net? Safety Net, that is. Second Life suffering from Inflation!! !